THIRTY-EIGHT. Yes, 38. At his current rate of assists Benjamin Mendy would obliterate the Premier League record (20 by Thierry Henry) and cement himself as a footballing deity. I know, this is pretty impossible. The flying Frenchman, however, now gives Pep Guardiola a new-found tactical flexibility that could prove the difference in what is a tough task of retaining the Premier League title – a feat not achieved since United in 2008-09. The club’s social media extraordinaire-turned-footballer has started the season incredibly strongly, racking up a total of four assists in as many games. 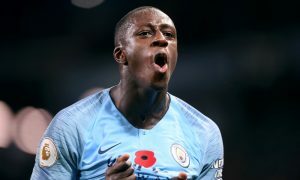 And who knows, our energetic Mendy may finish the season with more assists than Kevin De Bruyne and David Silva. Upon his signing, I wrote for City Watch about how Mendy’s arrival would ease the woes of City’s central defenders and this sentiment still remains. Speed and mobility are essential to implement Guardiola’s game plan, something that previous full-backs were unable to provide. With transitions becoming an increasingly important fixture in the modern game, it’s important to get it right. Some may argue that recent shortcomings against counter-attacking teams such as Liverpool, who are notoriously fast in transitions, demonstrate the need for a faster set of full-backs and this is where Mendy can help us defensively. This year, with Mendy’s blistering pace, the pressure on centre-backs will be lessened as both full-backs are able to recover quickly and regain their defensive position. And this fits nicely with how City can counteract these shortfalls. Mendy’s positioning as a flying full-back now gives Guardiola the option to deploy a 3-5-2, or variations of, giving greater stability in the heart of City’s defence and providing an extra body for these key transitions in big games. As we’ve seen so far this season, Mendy is a full-back with real attacking intent. As far as his Huddersfield performance goes, the left-back was essential to City’s attack in his role as a left wingback, creating countless chances with his pinpoint crosses. Despite Delph’s solid showing last season at left-back, his lack of attacking ability left our defence lopsided with Walker bombing on and Delph needing to be more conservative in his approach. This year, Pep can afford to adapt his style, with a 3-5-2 likely becoming one of his more favoured options. With the introduction of wing-backs, Aguero and Jesus can begin to solidify a partnership up top with Mendy and Walker providing the width. The tactical options become greater with his newfound form, allowing Pep to try and test a wealth of new options, something we couldn’t do with last season’s personnel. However, the movement away from our traditional 4-3-3 could mean less playing time for Sane and Sterling which could prove an issue in keeping our army of attacking talent happy. Against Huddersfield, we saw some of these tactics on show. Mendy was allowed to threaten and roam on his left flank. The opposite side saw Bernardo Silva acting as almost a false right wingback. When in possession, Bernardo came inside to control the game with his namesake David, whilst John Stones shifted across to right back. This tactical approach allowed City to control the game whilst giving Mendy the freedom on the left to terrorise the Terriers. Mendy’s introduction allows us to utilise a more attacking 3-5-2 system. But this isn’t all. Mendy’s comfortability on the ball allows him to also come inside and control the midfield, much like Delph did last season. A pertinent example of this came against Huddersfield as his marauding run through the inside left channel, which David Silva would usually occupy, saw a brilliant combination with Jesus which culminated in the Brazilian’s first goal of the season. Mendy’s defensive ability has been brought into question already but having yet to be properly tested, it’s unfair to pass judgement so soon. What we do know is that our very own flying Frenchman has been a revelation this season and, if performances continue, he has a chance to cement himself as the best left-back in the league. With a long and difficult season ahead, Mendy’s impact on the team could be huge. If he can keep up his form, he will be a Premier League assist king. Yes, it’s unlikely, but his influence on City’s season could be the difference between a good and a great season. His infectious personality and exciting ability make him a perfect ingredient for this melting pot of City superstars.